Stephen Strasburg’s first start back from the 15 day disabled list against the Florida Marlins can best be described in one word – rusty. The evening resulted in an 8-2 loss, his third of the season, and was the shortest outing of his Major League career after 4.1 innings. Both of the Nationals runs were unearned. Marlins starter Anibal Sanchez was dominant, shutting down the first six Nats he faced before ending a short lived no-hit bid in the third thanks to a single by Ivan Rodriguez. The biggest weakness facing Washington tonight besides Strasburg’s rust and quit bats was Josh Willingham’s defense in left field. Florida seemed to really like knocking their hits to that side of the field tonight, keeping Willingham on his toes. 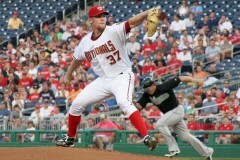 The Washington bullpen saw quite a bit of action due to Strasburg’s early exit. Both of the team’s long relievers entered the game with Miguel Batista pitching 2/3 of an inning and Crag Stammen making his first relief appearance with the Nationals going two full innings, giving up a run in the sixth. Doug Slaten continued his scoreless streak which is now up to seven consecutive innings. Despite the loss and Strasburg’s struggles, the Nationals pitching staff did have something to smile about — they struck out the Marlins 10 times while the Nats got caught with a K 6 times. It’s not much, but it’s something. As of now, there is no cause for concern regarding Strasburg’s health or mechanics. It’s just a part of the growing pains he’ll have to endure as his career continues. He is still just a 22-year-old rookie after all. Check back later Wednesday morning for more on the pre-game festivities honoring Hall of Fame Class of 2010 inductee Andre Dawson of the Montreal Expos. Strasburg threw only one changeup in his first 30 pitches or so, which pretty much took him out of his game. He didn’t have confidence in it, and the free-swinging Marlins sat on fastballs. To be able to gut through a start when you don’t have your best stuff is something you get through experience. Is it just me, or do the stands look fairly empty for a Strasburg game? It isn’t just you, Max. The total paid attendance was 25,939, which is the smallest home crowd for Strasburg start by 6,000 people.